Sam was a boy with an old man’s face, an old man’s body, an old man’s diseases, and a young man’s ambition, drive and dreams. Sam is still, and will always be, worth your time getting to know, despite the distressing news that he died last Friday at the age of 17. You may have seen stories about Sam Berns, who had the terminal illness called Progeria. His life, and the determination of his physician parents to save it and find a cure for Progeria, has been memorably documented by the husband and wife producing team of Sean Fine and Andrea Nix Fine. I sat down for a 30 minute conversation with the Fines during a high point in Sam’s life and theirs. It was at the Nantucket Film Festival this past summer. And the Fine’s new HBO documentary Life According to Sam was a featured attraction. You can listen to our conversation HERE. Sam was there – thank goodness -- to meet and greet and answer questions – and bask. I was reluctant to see Life According to Sam. I didn’t know if I was up to spending so much time watching such a frail looking boy with such a poor prognosis. That was before I heard Sam speak. Director Sean Fine told me about his very first meeting with Sam, when Sam was only 13. “We sat down at a Chili’s in Foxboro, Massachusetts. …. We’re sitting in this big booth and we started to talk to Sam. Sam made you forget about his disease. He made you forget about it with his intelligence and wit and aspirations. To hear Sam say it was to believe it was possible, especially after seeing the film’s opening seen of the complex, imaginative world Sam built out of Legos. 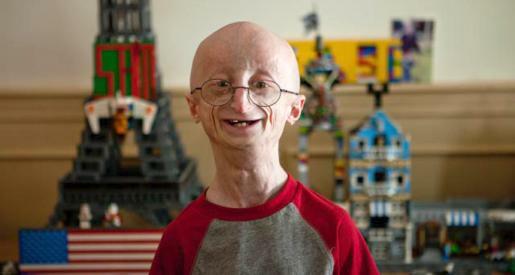 Sam made you forget Progeria when, as you can see in Life According to Sam, a well-intentioned school administrator first rejected his request to try out for the physically demanding high school marching band. Sam, with his advocacy of his parents, refused to take no for an answer. With the help of a specially fitted harness to support a heavy drum on his fragile frame, Sam marched. ““They don’t complain. I never heard them complain," said Anrea Nix Fine of the Sam's parents. “It makes you assess what you feel is important, and not necessarily about how much time you have,” Andrea says. So many hearts are aching right now for Sam’s parents, Doctors Leslie Gordon and Scott Berns. So much is still riding on their drive to find a treatment or cure for Progeria, which has made some progress through their Progeria Research Foundation. Sam –the star power he exhibited in person made it feel so appropriate to call him by his first name only – lived until the age of 17 – four years longer than the average child with Progeria. Which reminds me of something Sam said in the Fines’ documentary. If the anchorman in "Broadcast News" had been based on my former boss Peter Jennings, it would have been a different movie. To repair a country after a genocide, where the killers and the survivors still live in the same neighborhoods, takes a lot of time.